REDDING, Calif. - Simpson University’s Master of Arts in Counseling Psychology (MACP) program honored Charlene Ramont as Community Member of the Year during a graduate award reception this month. Ramont is a public health program and policy analyst for Shasta County Public Health, focusing on health equity. Ramont is a guest lecturer each year in the Issues of Diversity in Counseling course where she teaches on issues related to poverty. Ramont’s role with the county also includes oversight of Reach Higher Shasta, an initiative designed to promote higher education options among north state students. “The MACP program could not do what we do without the support and involvement of local agencies like Shasta County Public Health,” Dr. Jackson said. Simpson University’s M.A. in Counseling Psychology program began in January 2010. It has 27 current students and has graduated 28. The rigorous program is designed to prepare students for licensure in California as marriage and family therapists or licensed professional clinical counselors. In addition to Ramont, MACP faculty member Lisa Jellison was honored for Excellence in Teaching; and Jeannie Jacobs was named Clinical Supervisor of the Year. Seven program graduates were also given awards and special recognition in the Oct. 4 evening ceremony inside the J.D. Williams Suite on campus. 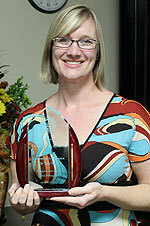 Photo: Charlene Ramont, MACP Community Member of the Year. Photo by Jessica Law.